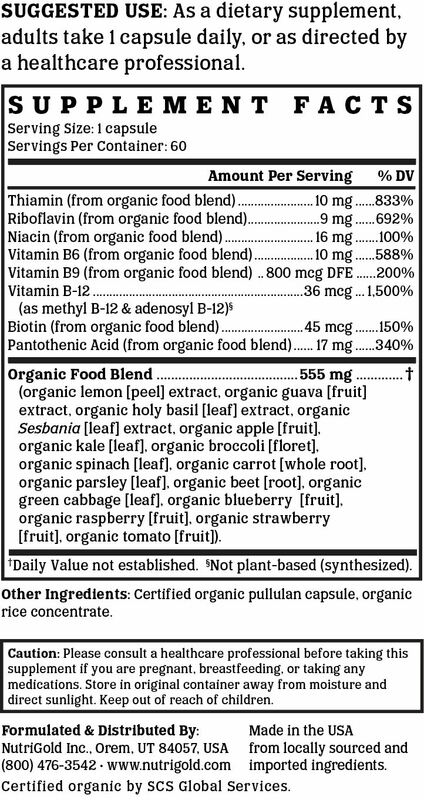 B-Complex Gold is a formulation of whole-food nutrients concentrated from certified organic, non-GMO fruits and herbs. Each serving of this gentle, nourishing blend provides more than 100% DV of all B vitamins without the metallic aftertaste associated with synthetic vitamin isolates. B-Complex Gold is manufactured in the USA to industry-defining quality standards and is verified by independent third-party labs to meet identity, purity, and potency label claims. B-Complex is a synergistic combination of all the essential B vitamins. The best way to get all the essential B vitamins in therapeutic amounts is to consume a diet that is rich in whole grains, fruits, and vegetables. However, because most individuals do not meet this daily requirement, supplementation may be essential to minimize deficiency risk. 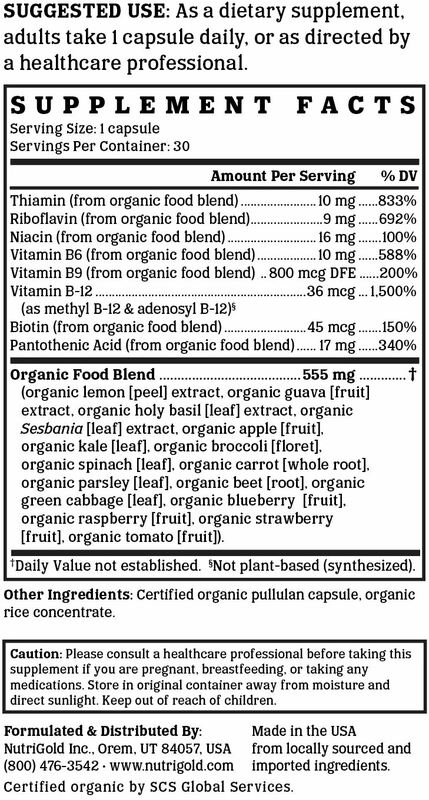 Most commercially available B-Complex supplements feature vitamins either as (1) synthetic isolates, which include vitamins created wholly in a lab from industrial chemicals and solvents; (2) fermented nutrients, which are created by taking synthetic vitamin isolates and making them more bioavailable by fermenting them in nutritional yeast and/or probiotics; and/or (3) whole-food/food-sourced nutrients, which are vitamins concentrated from natural food sources (e.g. herbs, fruits, spices, & vegetables). B-Complex Gold is Non-GMO Project Verified, which provides assurance that the product has been manufactured in accordance with the best practices for GMO avoidance. The Non-GMO Project is North America's premier verification program. The USDA’s National Organic Program certifies products as being organic based on farming, handling, processing, distribution, and labeling practices. The certification indicates that B-Complex Gold is grown without synthetic pesticides or fertilizers, and is free of GMOs and antibiotics. Vegan Action has offered vegan certification since 1995. Their official seal is proof that B-Complex Gold does not contain ingredients derived from animals or animal by-products, is free of animal-derived GMOs or genes, and is not the subject of ongoing animal testing. Most consumers consider kosher products to be cleaner, healthier, or better than non-kosher products. The Ko Kosher symbol on B-Complex Gold is assurance of our brand's unwavering and uncompromising commitment to accountability, quality, and overall safety. We like to make supplements that can be enjoyed by everyone. That's why our products are always compliant with the best practices for avoiding allergens and minimizing cross-contamination. B-Complex Gold is free of soy, gluten, egg, milk, peanut, shellfish, and corn allergens. Consistent with our guiding principle to “do no harm,” B-Complex Gold is manufactured without the use of additives or preservatives. It contains absolutely NO contaminants, pesticides, herbicides, harmful additives, residual solvents, magnesium stearate, or hexanes. Like all NutriGold products, B-Complex Gold is subject to over 140 purity and potency assays by independent, third-party labs to ensure that the product meets or exceeds its claims. So, you can be certain that what's on the label is what's in the bottle. Nothing more, nothing less.